HFCs, potent greenhouse gases, are commonly used as refrigerants. Photo by Frank van den Bergh/iStock. A new WRI study finds that there are many “win-win” opportunities for the United States to reduce emissions and save money for consumers and businesses. Over the coming weeks, our blog series, Lower Emissions, Brighter Economy, will evaluate these opportunities across five key areas—power generation, electricity consumption, passenger vehicles, natural gas systems, and hydrofluorocarbons—which together represent 55 percent of U.S. greenhouse gas emissions. Hydrofluorocarbons (HFCs) are a small but rapidly growing component of U.S. (and global) greenhouse gas (GHG) emissions. These gases, commonly used for cooling in appliances or as foam-blowing agents and aerosols, are potent greenhouse gases. Some HFCs can trap thousands of times more heat than carbon dioxide (CO2). The climate potency of HFCs are a problem because their use is rising due to the phase-out of their ozone-depleting predecessors, hydrochlorofluorocarbons (HCFCs) and chlorofluorocarbons (CFCs), by 2030. 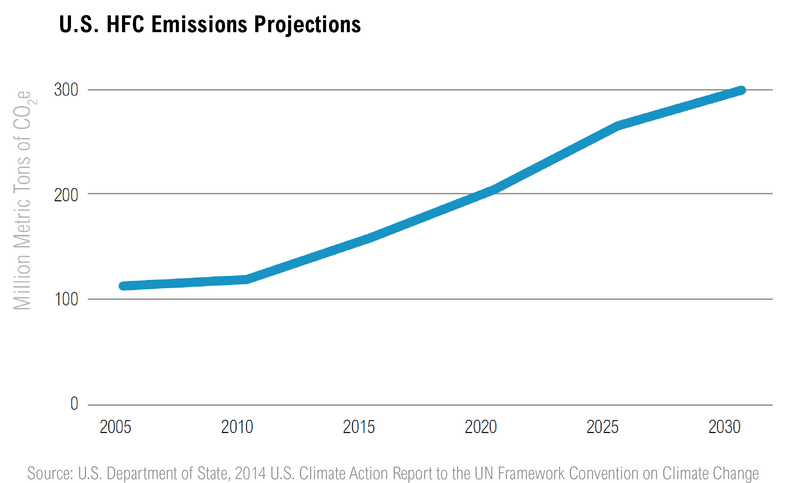 HFC emissions are expected to grow 120 percent over current levels. Fortunately, climate-friendly substitutes already exist, and some of these alternatives can even create net savings for consumers. Coca-Cola, Pepsi, Heineken, Red Bull and Ben & Jerry’s have improved efficiency 10-40 percent through coolers utilizing low- or zero-global warming potential (GWP) HFCs. At least one million cars on the road today worldwide use low-GWP air conditioning refrigerant, and that number was expected to double by the end of 2014. EPA data suggests HFC emissions could be reduced by more than 40 percent compared to a business-as-usual scenario in 2030 entirely through measures with a negative or break-even price today. Although converting to HFC alternatives may offer net cost savings over time, some have high upfront costs, may require equipment replacement, or may need facility and vehicle redesigns. Additionally, customers who purchase refrigeration or air conditioning equipment may not know about the climate impacts of high-GWP HFCs or the availability of alternatives. Because of these barriers, the U.S. market may not rapidly adopt zero- or low-GWP HFC alternatives without new rules or financial incentives. The fluorocarbon industry set an innovation precedent when they began phasing out ozone-depleting CFCs after the Montreal Protocol took effect in 1989. This spurred technological development and investment in a new generation of air conditioning and refrigeration equipment, creating significant benefits to public health and the environment while producing lifetime savings for consumers. EPA found that globally, new products typically did not cost more than existing ones, and some products were actually cheaper to maintain than conventional equipment because of higher efficiencies, product quality and reliability. Momentum is building worldwide to phase down high-GWP HFCs. More than 100 nations support the proposed North American amendment to the Montreal Protocol, which would reduce HFC consumption 85 percent by 2035 compared to 2008–10 levels. Numerous HFC producers and consumers have also voiced support for a global phase-down, including the Alliance for Responsible Atmospheric Policy, an industry coalition of about 100 manufacturers and businesses relying on HFCs. Despite this progress, the Montreal Protocol has yet to be amended because several countries still oppose lowering their HFC use. Meanwhile, EPA is driving cost-effective technology adoption through its authority under the Clean Air Act. EPA has already started offering incentives and standards to phase out high-GWP HFC use in passenger vehicles, pickups, vans and combination tractors. EPA also proposed rules in July 2014 to push higher-GWP HFCs out of the market for various applications through its Significant New Alternatives Policy (SNAP) program, and last Friday, they finalized a rule to approve some low-GWP alternatives for use. EPA should finalize its proposed rules under the SNAP program to phase out some uses of high-GWP HFCs and continue to phase down the use of other HFCs where safer, cost-effective alternatives exist. Even though EPA just finalized its proposed rule to list new alternatives for use, they should continue evaluating and approving appropriate low-GWP alternatives as they become available. EPA should extend air conditioning and refrigeration equipment servicing and disposal requirements under the Clean Air Act for other refrigerants to HFCs , as well as increase initiatives to capture and recycle HFCs from existing equipment to reduce the amount of new HFCs produced. Over time, EPA or Congress may also consider implementing a more flexible program (compared to the SNAP program) to reduce high-GWP HFCs emissions either through the Clean Air Act or via new legislation, as the flexibility of these measures could create deeper reductions in a cost-effective manner.